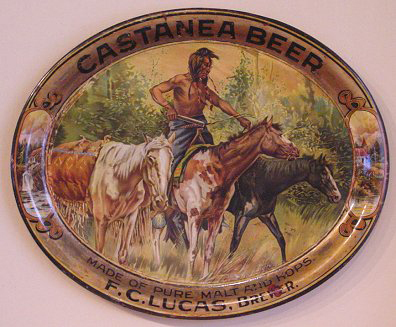 Serving Tray for Castanea Beer from The F.C. Lucas Brewer of Lock Haven, Pennsylvania. This is a real show-stealer of a tray with the fantastic image of a native american with horses in the wild. The vignettes on each side of the rim of this great 16.5″ x 13.5″ oval really show how much detail and care went into the design. This tray was a stock design produced by the H.D. Beach Co. of Coshocton, OH and pre-prohibition trays like this don’t come around often.